When Prince William and Miss Catherine Middleton married on April 29, 2011, British wedding ceremony music played an important role. Blending traditional songs with some newly commissioned pieces, they honored their country while setting a romantic yet reverent tone. The long center aisle of Westminster Abbey and the many important Royal and Noble guests meant that they needed extra processional and recessional songs. Kate naturally had her own song for the bridal processional. During the wedding ceremony, music included three hymns and an original anthem. And of course, there were several fanfares. As guests were being seated and before the Queen arrived, a selection of organ pieces played: Fantasia in G (Pièce d’orgue à 5) by Johann Sebastian Bach, followed by Veni Creator Spiritus by the Master of The Queen’s Music, Sir Peter Maxwell Davies; Prelude on St. Columba Op. 28 by Sir Charles Villiers Stanford and Sonata for Organ Op. 28 (Allegro maestoso and Allegretto) by Edward Elgar. Canzona from Organ Sonata in C minor by Percy Whitlock. William and Kate chose three of these pieces—Farewell to Stromness, Touch Her Soft Lips and Part and Romance for String Orchestra Op. 11—specifically because they were played at the Service of Prayer and Dedication for The Prince of Wales and the Duchess of Cornwall's (aka Prince Charles and Camilla) wedding in 2005. The Service began with a Fanfare by The State Trumpeters of the Household Cavalry to mark the arrival of The Queen and The Duke of Edinburgh. The Fanfare was followed by three Processionals. For the Procession of The Queen, Prince William and Kate chose the Bridal March from "The Birds" by Sir Charles Hubert Hastings Parry. Prelude on Rhosymedre by Ralph Vaughan Williams accompanied the Procession of the Clergy and was chosen for its Welsh echoes. The Procession of the Bride: When Kate Middleton walks down the aisle, she was accompanied by I Was Glad, also by Sir Parry. This anthem was written for the coronation of King Edward VII and has been used for every coronation since then. It was also used in 2002 for the Golden Jubilee of Queen Elizabeth II, the groom's grandmother. Hymns: Prince William and Kate chose three hymns for the Service: Guide Me, O Thou Great Redeemer, words by William Williams, translated by Peter Williams and others, and music by John Hughes. The second was Love Divine All Love Excelling, words by Charles Wesley and music by William Penfro Rowlands. The third was Jerusalem by Sir Charles Hubert Hastings Parry, words by William Blake. All three hymns were chosen because they are favorites of William and Kate. The Anthem and Motet: The Anthem, This is the Day Which the Lord Hath Made, was composed especially for the occasion by John Rutter. It was commissioned by Westminster Abbey as a wedding present for Prince William and Miss Middleton and was performed by both the Choir of Westminster Abbey and the Chapel Royal Choir. Mr. Rutter is a British composer, conductor, editor and arranger who specializes in choral music. The Anthem was followed by the Motet ‘Ubi Caritas’ by Paul Mealor, a Welsh composer. At the young age of 35, Mealor represented William and Kate's desire to have contemporary music included in their wedding. His composing studio is on the Isle of Anglesey, where Prince William and Kate lived as newlyweds. This version of ‘Ubi Caritas’ was written on Anglesey and premiered at the University of St. Andrews in November 2010. The National Anthem, aka "God Save the Queen was sung immediately before the Signing of the Registers. The Signing of the Registers: During the Signing of the Registers, the choirs sang Blest Pair of Sirens, words by John Milton from At a Solemn Musick, music by Sir Charles Hubert Hastings Parry. Following the signing, there was a Fanfare by the Fanfare Team from the Central Band of the Royal Air Force. The Fanfare, called Valiant and Brave, after the motto of No. 22 Squadron (Search and Rescue Force) was specially composed for this Service by Wing Commander Duncan Stubbs, Principal Director of Music in the Royal Air Force. 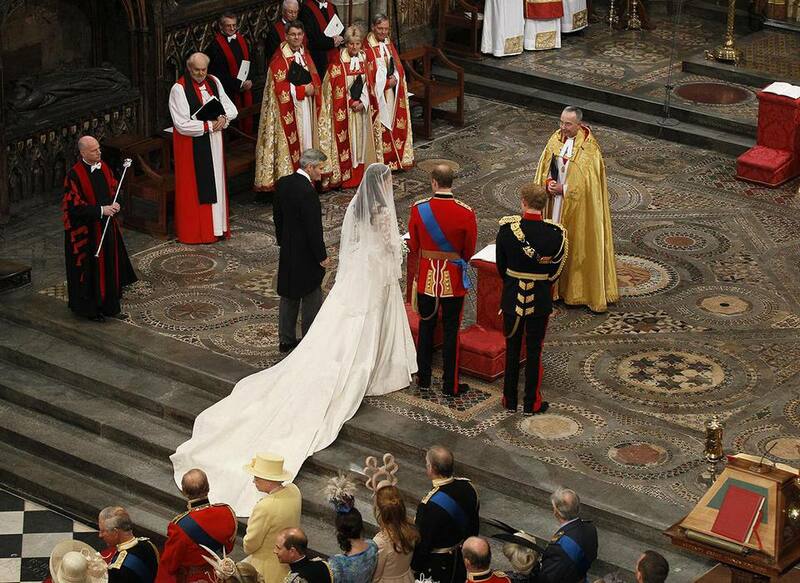 William and Catherine exited the church as husband and wife to the sound of Crown Imperial by William Walton. Toccata from Symphonie V by Charles-Marie Widor and Pomp and Circumstance March no. 5 by Edward Elgar followed the Service.